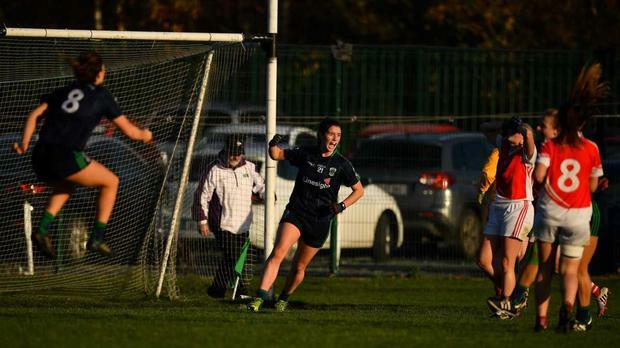 Substitute Roisin McGovern proved the match-winner for Foxrock-Cabinteely at sun-drenched Bray Emmets as her late, late goal sent the Dublin and Leinster champions into their first All-Ireland Senior Ladies Club Football Final since 2016. In a dramatic finish, the sides were level at 1-8 each when Donaghmoyne’s Cathriona McConnell was off-target with a free. Fox-Cab swept to the other end of the pitch and McGovern fisted home a famous goal to send Pat Ring and Peter Clarke’s charges through to a final clash with Mourneabbey on December 8. There had been little to separate the sides in the opening half as they were level three times. An early goal for Fox-Cab skipper Amy Ring and an injury to Hazel Kingham put pressure on five-time winners Donaghmoyne but they responded admirably, a brace of points for Amy Garland and the exceptional free-taking of Cathriona McConnell keeping them in touch. Two unanswered points from Fiona Claffey and Laura Nerney pushed Fox-Cab into the lead but Garland and McConnell drew it level once more. Donaghmoyne finished the half the happier, skipper Cora Courtney’s goal leaving them two ahead at the break, 1-6 to 1-4. An Amy Connolly point early in the second half left just one between the sides but scores were at a premium as the wides tally began to stack up for both sides. The game was end to end with both Aisling Tarpey and Linda Martin called into action and their top class saves ensured a nervy second half. Converted frees from McConnell and Louise Kerley pushed the Monaghan side into a three point lead. An Amy Ring free and a super score from substitute Jodi Egan left them just one behind. Ring was every inch the captain as she drew the sides level. A yellow card for Rosemary Courtney late on was a devastating blow for Donaghmoyne and with extra time looking like a distinct possibility, Donaghmoyne missed the free that, if converted, would surely have sent them through. When play resumed, Fox-Cab worked the ball to substitute McGovern, and she punched to the net with aplomb, to the delight of her team mates. After suffering an All-Ireland semi-final loss to Donaghmoyne in 2015 – and a final defeat against the same opposition two years ago – this was a sweet victory for Fox-Cab. And with Mourneabbey providing the opposition on December 8, there will be a new name on the Dolores Tyrrell Memorial Cup – as neither team has won the All-Ireland Senior title previously. Foxrock Cabinteely: A. Tarpey, A. Murray, S. Quinn, E. McDonagh, S. Goldrick, N.Collins, L. Fusciardi, T. O’Sullivan, C. Ni Mhurchadh, L. Nerney, A. Connolly, F. Claffey, H. O’Neill, C. O’Riordan, A. Ring (C). Donaghmoyne: L. Martin, J. Geoghegan, F. Courtney, L.Garland, H. Kingham, S. Courtney, J. Courtney, N. Callan, R. Courtney, A. Garland, L. Kerley, E. Treanor, C. McConnell, C. Courtney, S. McConnell. THE O’Sullivan sisters starred for Mourneabbey as the Cork and Munster champions marched into a fourth All-Ireland Senior Ladies Club Football Final in five seasons. 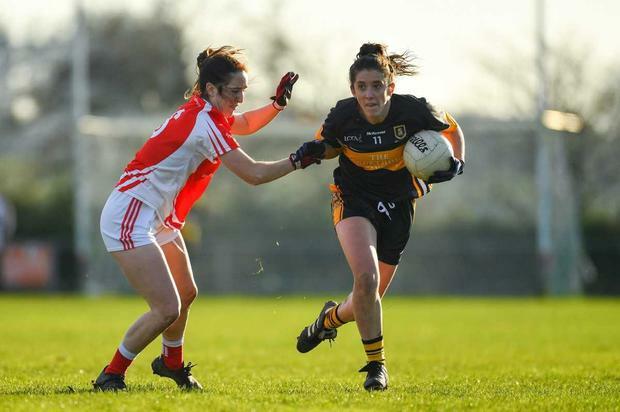 Doireann bagged 0-8 in an outstanding display and county skipper Ciara collected 0-3 as Mourneabbey set up a final meeting with Dublin’s Foxrock-Cabinteely on December 8. Hosts and Connacht champions Kilkerrin-Clonberne battled gamely in front of a huge crowd at the Clonberne Sports Field but Mourneabbey had too much know-how and experience. Just a point separated the teams when they met in a 2015 semi-final but eight points was the difference at full-time here. But Carnacon’s Connacht Final conquerors Kilkerrin-Clonberne enjoyed much of the opening possession, and only for a good Maebh O’Sullivan save, they could have rattled the net inside the first two minutes. Claire Dunleavy, on for the injured Nicola Ward, eventually opened Kilkerrin/Clonberne’s account on the five minute mark, before Mourneabbey got off the mark in the 8th minute when Doireann O’Sullivan landed the first of her scores. Kilkerrin/Clonberne looked very lively in the opening exchanges but the Cork champions defended excellently and eventually got a stranglehold on the game. Doireann O’Sullivan, who was an injury doubt coming into the game, kicked into form and put her side ahead in the 10th minute. From there until the 27th minute, Mourneabbey kicked six unanswered points as Kilkerrin/Clonberne were wasteful in front of goal, kicking four first half wides and dropping three short into Maebh O’Sullivan’s hands. Annette Clarke, Galway’s 2004 All-Ireland winning skipper, got Kilkerrin-Clonberne back on the score board in the 27th minute, just their second white flag of the game. Ailish Morrissey and Olivia Divilly added points and Kilkerrin-Clonberne trailed by 0-4 to 0-9 at the break. The intensity increased ten-fold after the half time whistle; Doireann O’Sullivan converted her sixth point of the day but Annette Clarke responded with an excellent point of her own, with the impressive Chloe Miskell adding another soon after. The action continued end to end with Kilkerrin/Clonberne throwing everything they had at Mourneabbey but the Munster champions were proving hard to contain and the O’Sullivan sisters continued to wreak havoc. Time was running out for the Galway outfit as they struggled to get within touching distance of their opponents. Skipper Louise Ward’s attempt at goal from a 21 yard free was saved on the line in the 28th minute and Mourneabbey survived. The visitors soaked plenty of pressure from the home side in the closing exchanges but an Eimear Harrington goal in stoppage time ensured their place in another final. Kilkerrin/Clonberne- L Murphy; A Costello, S Gormally, C Costello; S Fahy, L Gannon, H Noone; S Divilly, C Miskell; L Noone, L Ward, O Divilly; N Ward, A Clarke, A Morrissey. Subs – A Morrissey for K Mee (13), O Divilly for E Noone (22).